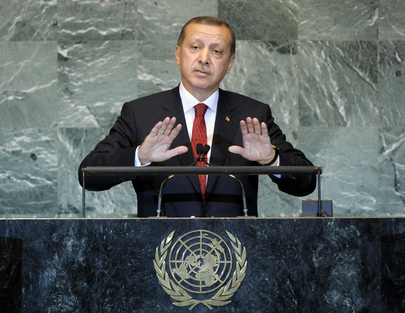 RECEP TAYYIP ERDOĞAN, Prime Minister of Turkey, said that the international community and the United Nations were being “tested” in an unprecedented way. The United Nations did not demonstrate the kind of leadership necessary to help mankind prevail over its concerns for the future; instead of remaining under the control and leadership of certain countries, the Organization should urgently reform itself. He had seen this need first-hand during a recent visit to Somalia. There, he had witnessed how the United Nations and the international community, in general, had remained helpless in the face of a massive tragedy. “This is a shame for the international community,” which must stop watching the famine in Somalia unfold “as if it were a movie” and, instead, act with great urgency. The long and shameful colonial history that had led to Somalia’s current situation also must be examined. “This is the tip of a great iceberg,” he said of the famine. No one could speak of freedom and democracy while that crisis went unaddressed. He said his country had launched a comprehensive aid campaign for Somalia and had collected some $300 million in donations, even as its official humanitarian assistance to the country surpassed $30 million. It had also held a donor conference that had resulted in millions being raised. Furthermore, by reopening its Embassy in Mogadishu, Turkey had also shown the world that claims of security concerns were no excuse for a failure to take action. While some political progress had given hope for the future, the civil war gripping Somalia for so long must end; with that change, the world would become a safer place. The United Nations should be the personification of the ideal that peace prevailed over conflict and that human conscience, rather than simple self-interest, prevailed, he said. The greatest impediment to the realization of that ideal remained the Arab-Israeli conflict. The fact that it remained unsettled, for the sake of political balance, was the greatest blow to the ideals of the Organization. Israel had violated 89 legally-binding Security Council resolutions, as well as numerous General Assembly texts. Noting that the United Nations had not taken steps to end the humanitarian crisis affecting the Palestinian people, he pointed out that it had imposed sanctions in other conflicts around the world — why not in the case of Palestine? The international community must act urgently to heal the “bleeding wound” that was the ongoing Middle East conflict. In that vein, no sanctions had been placed on Israel, which used phosphate bombs and had atomic bombs, whereas the possible emergence of a “whiff” of such activity elsewhere in the region would be prevented. In fact, the fault for the conflict lay with the Israeli Government, which continued to build new barriers to peace and to use disproportionate force. The ongoing blockade of Gaza persisted, despite the calls of the international community and the principles of the Universal Declaration of Human Rights — which forbade the isolation of a people, such as in Gaza. Real security for Israel could only be achieved through a lasting peace; nothing else would substitute. Today, the “newly flourishing political geography” in the Middle East meant that Israel would not be able to carry on in a state of conflict. Turkey deemed it necessary for the United Nations to put pressure on Israel to achieve peace and show it that it was not above the law. Recognizing the just demands of the Palestinian people to a State, and allowing them to take their place at the United Nations, was foremost among the path towards peace, he continued. Turkey’s support for the State of Palestine was unconditional; it would continue to work actively towards that goal, as well as towards the lifting of the illegal blockade imposed on Gaza. When an attack by Israel had taken place in international waters, Turkey could not remain silent. Its reaction to Israel had been a reflection of its position on Gaza; otherwise Turkey had never strayed from its principle of friendship and cooperation with any country, including Israel. However, in the case of the flotilla incident, Israel must apologize, pay compensation to the families of those who had been killed and lift the Gaza blockade without delay. Turkey’s position would not change until those demands were met. “We do not have a problem with the people of Israel,” he stressed, but with the aggressive policies of the Israeli Government. He said that from the start of the recent movements in the Middle East, Turkey had called for the world to “lend an ear”. It was essential that the free will of the people was recognized. “Times have changed”; the era of Governments that did not meet the demands if its people, that did not consider justice above all else, had come to an end. That call had been echoed throughout Libya, Egypt and Tunisia, providing hope for the future. But, still, other countries remained oppressed. The situation in Syria, for example, was a cause for grave concern. The actions of the leadership there were unacceptable. “Friends always speak the truth, no matter how difficult that might be,” he said of Turkey’s relationship with its neighbour. As the Syrian leadership continued to ignore those calls, Turkey would continue to support the demands of the Syrian people. It further expected the international community to do the same. In the case of Libya, the fact that “ Libya belongs to the Libyans” must be respected, he said. As the democracy was built, it was crucial to release Libya’s assets that currently existed in other countries, allowing the country to stand on its own two feet. He urged States to implement Security Council resolution 2009 (2011) and to allow the Libyan people to determine their own future. A resolution also must be found to the conflict in Cyprus. The United Nations plan, put forward in 2004, had shown that the Greek Cypriot side did not have the necessary political will to end the conflict. The Turkish Cypriot side, on the other hand, remained willing to resolve the crisis by the end of the year, enabling a united Cyprus to join the European Union without delay. Cyprus would defend that timetable, but if the “intransigent” attitude of the Greek Cypriot side did not change, the Turkish Cypriot fate could not be permitted to remain uncertain forever. Meanwhile, the occupation of the Nagorno-Karabakh region must end without delay. Turkey had shown leadership through its Security Council membership in 2010, and it would continue to do so if it were elected to a non-permanent seat for the period 2015-2016, he noted. Security, development and respect for human rights were parts of the same whole, and Turkey would always work towards those ideals.